For the first time, astronomers have discovered a (potential) high-energy counterpart to a fast radio burst, and also used a different burst to probe the cosmic web. Artist's impression of the 64-meter Parkes radio telescope shown with a bright radio burst blazing briefly far from the Milky Way's disk (red swath at right). The Milky Way image is from a hydrogen-alpha full-sky map. 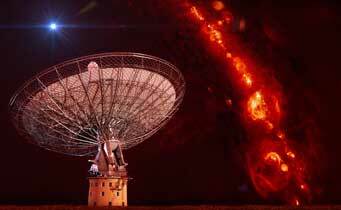 Astronomers used the Parkes telescope to make the second discovery in this story. They’re brief, they’re brilliant, and they’re baffling. Fast radio bursts are millisecond-long flashes of radio emission that can pack as much energy as the Sun will emit over thousands of years. They seem to come from outside our galaxy, since their signals are smeared out as though they’ve passed through cosmic amounts of intervening gas. But astronomers haven’t been able to figure out what creates them. If observers can detect enough fast radio bursts (FRBs) — right now they have fewer than 20 — they might be able to use the flashes to probe the stuff between galaxies. Given an FRB’s location and distance, astronomers could calculate how dense this intergalactic medium is between us and the burst and maybe learn about how turbulent and magnetized it is, too. So far, astronomers haven’t been able to home in on precise locations or distances for these events. But two new discoveries could help. 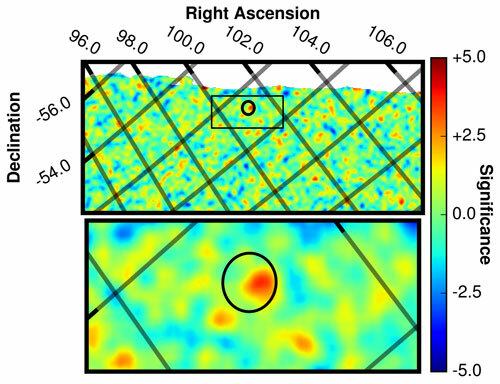 These data are from the Swift gamma-ray space telescope and show what appears to be a gamma-ray counterpart to the fast radio burst FRB 131104. Top row is wide-angle, bottom is a close-up. The black circle indicates the area of the sky that Parkes Observatory was observing when it detected FRB 131104. Within the circle there is a single prominent red peak, the signal of the gamma-ray counterpart. To pinpoint an FRB’s location, observers need to find a signal from the same thingamajig but at another wavelength. So James DeLaunay (Penn State University) and colleagues dug through data from NASA’s Swift satellite and the European Space Agency’s Integral spacecraft. Both space telescopes detect gamma rays and X-rays, the most energetic photons. Three FRBs went off in Swift’s field of view (one of them twice); none in Integral’s. Of those, DeLaunay found one, 1½-minute burst of gamma rays that also appeared around the same time as the radio burst called FRB 131104. Statistically, there’s more than a 99% chance that the FRB and the gamma-ray flash are related. If they are, then this is the first time an FRB has been detected at another wavelength. But resolution is fairly poor at these wavelengths, and the gamma rays are hard to track back to their source. Plus, the flash was relatively faint — not bright enough to trigger Swift’s onboard alert system, the team explains in the November 20th Astrophysical Journal Letters. If the two flashes are from the same source, then astronomers have a bit of a puzzle on their hands. The gamma-ray flash means the event packed more than a billion times more energy than the FRB indicates on its own. It’s unclear what would explain both the gamma-ray and radio emission. Study coauthor Derek Fox (Penn State) notes in a press release that the things that would best match the high-energy burst (such as a powerful supernova) shouldn’t create an FRB. Observers will need to find more FRB counterparts before they can come to any firm conclusions. Meanwhile, Vikram Ravi (Caltech), Ryan Shannon (CSIRO and International Centre for Radio Astronomy Research, Australia) and colleagues report their discovery of a different FRB in the November 18th Science. FRB 150807 is the brightest detected since the first of these flashes saturated the 64-meter Parkes telescope’s system back in 2001 (although astronomers didn’t notice that first one until a student went poking around the archival data several years later). 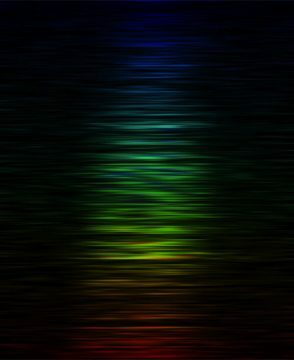 This "dynamic spectrum" of FRB 150807 shows the intensity of the burst over time at different radio frequencies, shown here as colors (red corresponds to lower frequencies, blue to higher frequencies) with time as the x-axis. The fine structure in the burst is called scintillation. Essentially the signal is “twinkling” as the waves interfere with one another differently at different frequencies. This pattern reveals that the plasma between us and the burst is fairly "placid." 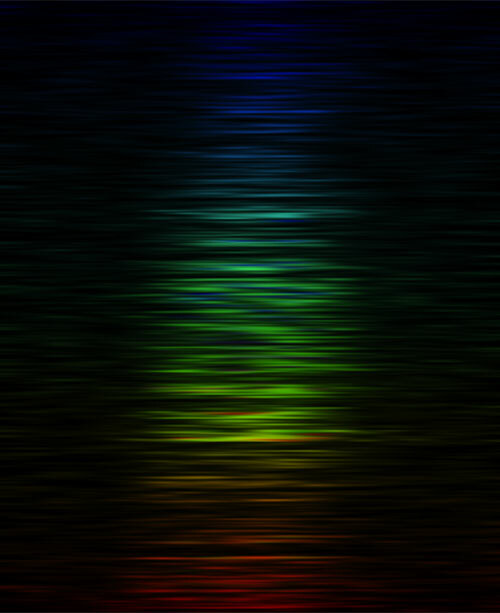 Every FRB’s signal is smeared across radio wavelengths; this dispersion measure is an indication that the radio waves traveled through lots of plasma in order to reach us. The more smeared the signal, the more plasma the waves traveled through. FRB 150807’s signal is smeared out the least of any burst yet seen, so this burst should be closer than the others. That doesn’t mean it’s in our galaxy, though — the dispersion is nearly four times what it should be for a source within the Milky Way. Furthermore, most of the galaxies in the swath of sky the FRB appeared in lie more than 1.6 billion light-years away, so if the burst is extragalactic, it probably came from this distance. 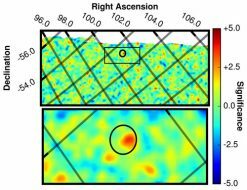 The team also calculated how strong the magnetic field is between the FRB and us by combining the dispersion with how the signal’s polarization varies with frequency. Notably, the field is the same strength as for a Milky Way pulsar about half a degree away on the sky. In other words, whatever magnetic field messed with the FRB’s signal, it’s basically all within our galaxy — there’s virtually no extra contribution from the stuff in intergalactic space or near the source. This makes sense, Ravi explains. The cosmic web is a gargantuan network of gas with structures on billion light-year scales, in which galaxies are caught like flies. In order for magnetic fields to exist on these large scales, they would have to be anchored to some kind of coherent plasma flow, but theorists say such flows shouldn’t exist. So the measurement is a nice confirmation of theorists’ predictions. The pattern in the signal at various frequencies also indicates that it’s being diffracted by clumpy plasma between the source and us. These results might seem a little esoteric, but they’re the heralds of what astronomers have been hoping FRBs will do for them: enable them to probe the intergalactic medium. The thin plasma between galaxies contains approximately 40% of the normal matter in the universe but is a doozy to study, Ravi says. FRBs could change that.